Antibacterial drugs are the chemical substances which are derived from bacterium to cure bacterial infections. The global antibacterial drugs market is driven by the rapidly growing antibacterial resistance and demand for new broad spectrum agents. The same market is likely to face two challenges such as deficiency of return on investment and expiry of patented drugs. The global antibacterial drugs market also exhibits a robust pipeline and market penetration of generic drugs. This market identifies opportunities in Spanish market through investments by the major players. Additionally, an economic growth in Latin America would bring a positive impact on the global antibacterial drugs market. In terms of routes of administration, the global antibacterial drugs market has been segmented into enteral, parenteral and others. The enteral segment is expected to witness the largest market share in 2016 and is expected to grow by a remarkable rate during the forecast period. The parenteral segment claimed the second largest market shared in 2016 although it is estimated that the market share of parenteral segment will decline during the forecast period, owning to a global trend of switching over parenteral route of administration to enteral route. The others segment (such as topical, inhalation) is expected to claim the least market share in 2016 although the market share is estimated to rise during the forecast period, due to increasing number of skin infections, conjunctivitis, inflammation in the middle ear etc. The global antibacterial drugs market has been further segmented into hospital pharmacies, drug stores and retail pharmacies and online sales, in terms of distribution channel. The retail stores and drug stores segment is anticipated to experience the largest market share in 2016 and this segment will grow by a significant rate during the forecast period, due to the increasing number of retail drugs stores, and the availability of antibacterial drugs through retail pharmacies and drugs stores. The hospital pharmacies segment is estimated to encounter the second largest market share in 2016 although the market share will decline during the forecast period, owing to the worldwide trend of hospital consolidations. The online sales segment is expected to face the least market share in 2016, although it will grow by a significant rate during the forecast period, owing to the global emerging trend of e-pharmacy. 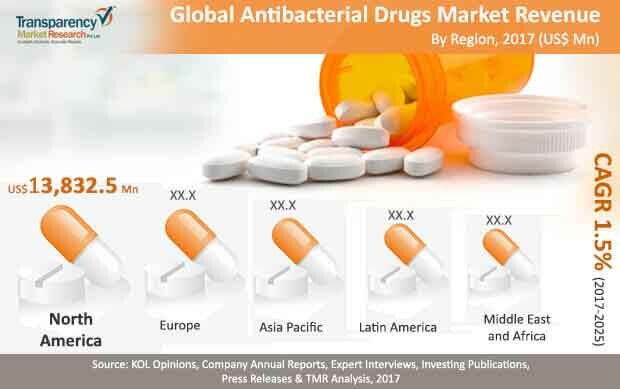 Geographically, the global antibacterial drugs market is categorized into five regions such as North America, Europe, Asia Pacific, Latin America and Middle East and Africa. The North America region is the leading contributor to the global antibacterial drugs market and will grow by a significant rate during the forecast period, due to the high infections rate, high diagnosis and treatment rate. Compared to the North America region, the Europe will grow by much faster rate during the forecast period, owing to the continuous inventions of antibacterial drugs in Europe. The Asia Pacific region is expected to claim the third largest share and this region will grow by the fastest rate among five regions, because of the huge patient pool and growing number of infected cases. The tendency of self-medications of antibacterial drugs is currently exhibited in Middle East and Africa and Latin America region. Prominent key players are Bayer AG, Pfizer Inc., Sanofi, GlaxoSmithKline Plc. (GSK), Merck & Co., Inc., AstraZeneca, Johnson and Johnson, Bristol Myers Squibb Company, Novartis Ag, and Allergen Plc. In August 2016, Pfizer entered into an agreement with AstraZeneca to acquire the development and commercialization rights to its late-stage small molecule anti-infective business, primarily outside the U.S. GlaxoSmithKline Plc. acquired GlycoVaxyn AG, a specialist vaccine biopharmaceutical company. The acquisition will allow GlaxoSmithKline Plc. to share the innovative biological platform technology used for the development of therapeutic vaccines in treating bacterial infections in January 2015. This report provides in-depth region wise and country wise analysis of the antibacterial drugs market. Stakeholders of this report include manufacturers of antibacterial drugs, raw material suppliers, researchers and new players planning to enter the market. The report provides qualitative and quantitative analysis of the global antibacterial drugs market. Qualitative analysis comprises market dynamics, trends, product overview, and country-level market information. Quantitative analysis includes market share held by companies, market size, and forecast for the global antibacterial drugs market in major countries globally such as the U.S., Canada, Germany, France, United Kingdom, Japan, China,, India, Brazil, Mexico, South Africa GCC countries and others. Market revenue is provided in terms of US$ Mn from 2015 to 2025 along with the compound annual growth rate (CAGR %) from 2017 to 2025 for all the segments, considering 2016 as the base year. The executive summary of the report provides a snapshot of the antibacterial drugs with information on leading segments, country wise market information with respect to the market size, growth rate (CAGR %), and growth factors. The market overview section comprises impact factors such as drivers, restraints, and opportunities for the global antibacterial drugs market. These factors would aid the stakeholders in establishing a strong foothold in the global antibacterial drugs market. Furthermore, the market overview section comprises key industry events, product overview, market attractiveness analysis and emerging trend in the antibacterial drugs. The market attractiveness analysis provides a graphical view comparing the growth and market dynamics in various segments and country wise to identify the most attractive market. Based on drug class, the global antibacterial drugs market is classified into B – lactams, quinolones, macrolides, tetracycline, aminoglycoside, sulfonamide, phenicols, and others. In terms of routes of administration, the global antibacterial drugs market has been segmented into enteral, parenteral and others. Likewise, the global antibacterial drugs market has been further segmented into hospital pharmacies, drug stores and retail pharmacies and online sales, in terms of distribution channel. The retail stores and drug stores segment is anticipated to experience the largest market share in 2016 and this segment will grow by a significant rate during the forecast period. Geographically, the antibacterial drugs market has been categorized into North America, Europe, Asia Pacific, Latin America, and Middle East & Africa. Moreover, analysis for the major countries comprising U.S. Canada, Germany, U.K., France, Japan, China, India, Brazil, Mexico, and South Africa and others have also been provided in the report. A detailed qualitative analysis of the factors responsible for driving and restraining the growth of the antibacterial drugs market in various regions has been provided in this section.